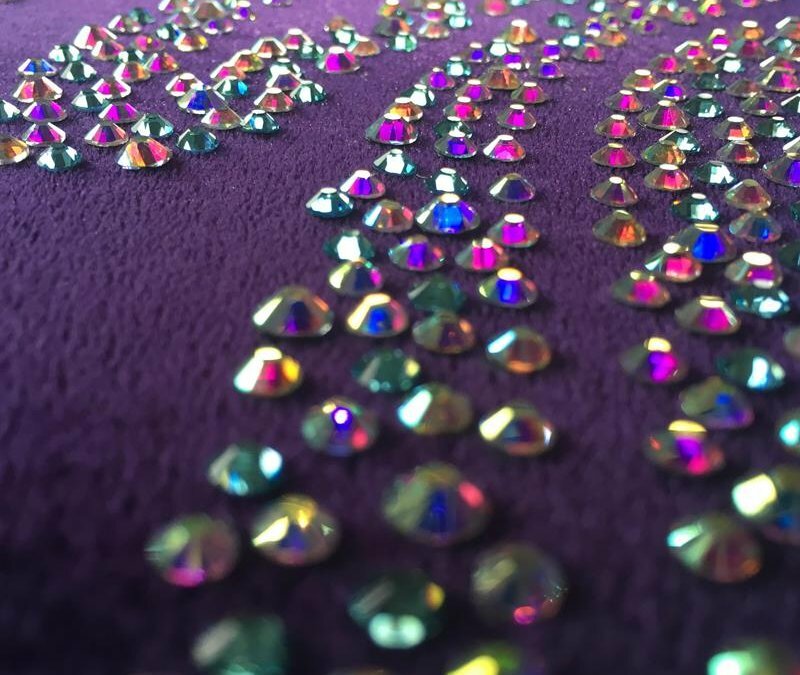 If you’re reading this, then you may already be using rhinestones on your costumes or be thinking about using them. There are many different types of stone out there and you want to make the right choice for the right application as they’re not all equal. A rhinestone, paste or diamanté is a simulated diamond originally made from rock crystals gathered from the river Rhine, hence the name. 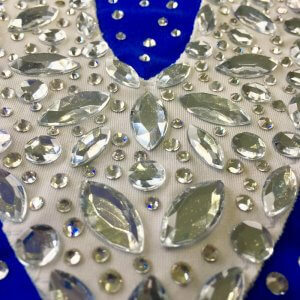 Today, ‘rhinestones’ are actually made from a type of glass called ‘crystal glass’ to which lead and a foil backing have been added and they come in many different colours and cuts. You can also buy acrylic stones which give a similar look but less sparkle. Crystal rhinestones are now produced mainly in Austria by Swarovski and in the Czech Republic by Preciosa. 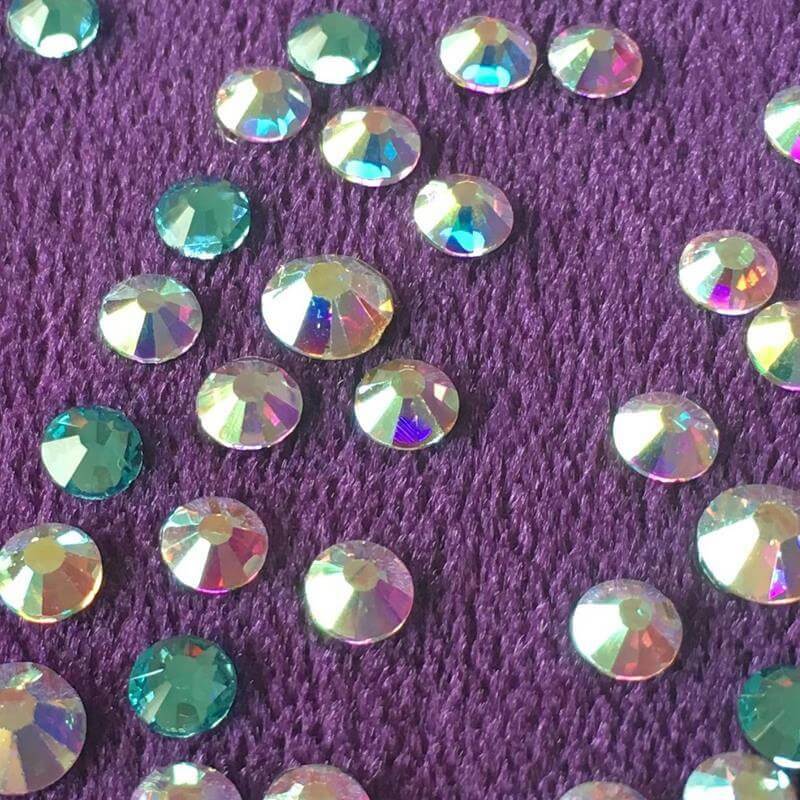 Lower quality glass rhinestones are produced in Korea/China which give a similar look but at a much lower price. So although used interchangeably, Swarovski and Preciosia are actually brand names rather than a stone type. 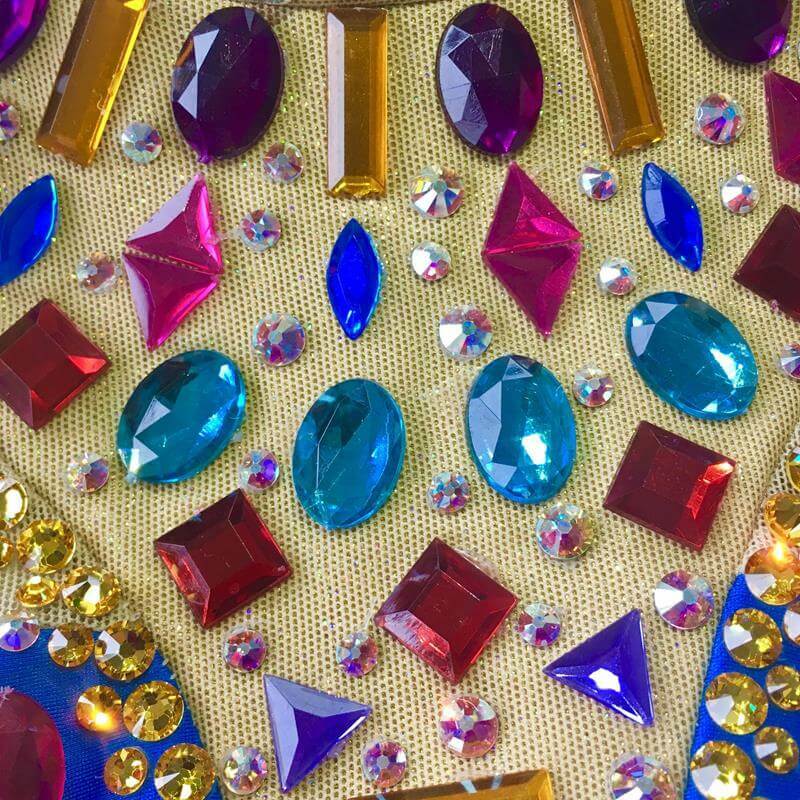 So what should you look for when choosing your rhinestones? 1.Cut – similar to diamonds, the way a piece of glass is cut has a huge impact on the way that it reflects colour and light. Generally speaking, the more facets the stone has, the more it will reflect the light. An increased number of facets also increases the risk of the glass breaking during manufacture as well as taking more time to cut and this is partly why the highly faceted stones such as Swarovski are more expensive. 2. Colour – the colour of the stone has a big impact on how much light (and therefore sparkle) the stone will reflect. This is back to the basics of light absorption that you probably covered in high school science but in essence, the lighter the stone, the more light it will reflect. The darker the stone, the more light will be absorbed. So, if you’re choosing darker colour stones, then the quality of cut will become a more important factor in how much light is reflected from that stone. Pinks and purples are the most difficult stone colours to produce and therefore are the most expensive colours regardless of which brand of crystals you use. 3. 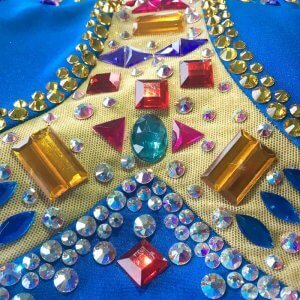 Price – for most people this is an important consideration especially when stoning competition costumes as most outfits will require upwards of 1000 crystals to make any sort of impact. 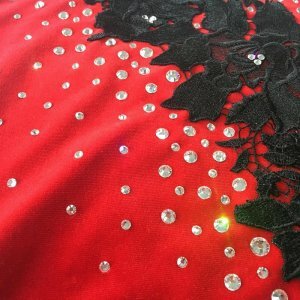 The dresses you see in Olympic ice skating have got 10,000-15,000 crystals on them! 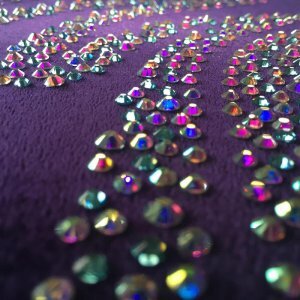 Many of the costumes in contemporary dance and Irish dance have also got 10,000+ crystals on them so you can see how the price racks up quickly. Unless you have a large budget then most people will struggle to afford a heavily stoned dress using Swarovski stones. So by now you’re probably thinking ‘how can I get the most amount of sparkle for the least amount of money’ right? Well I have a few suggestions for you! First, consider what type of crystal you really need. 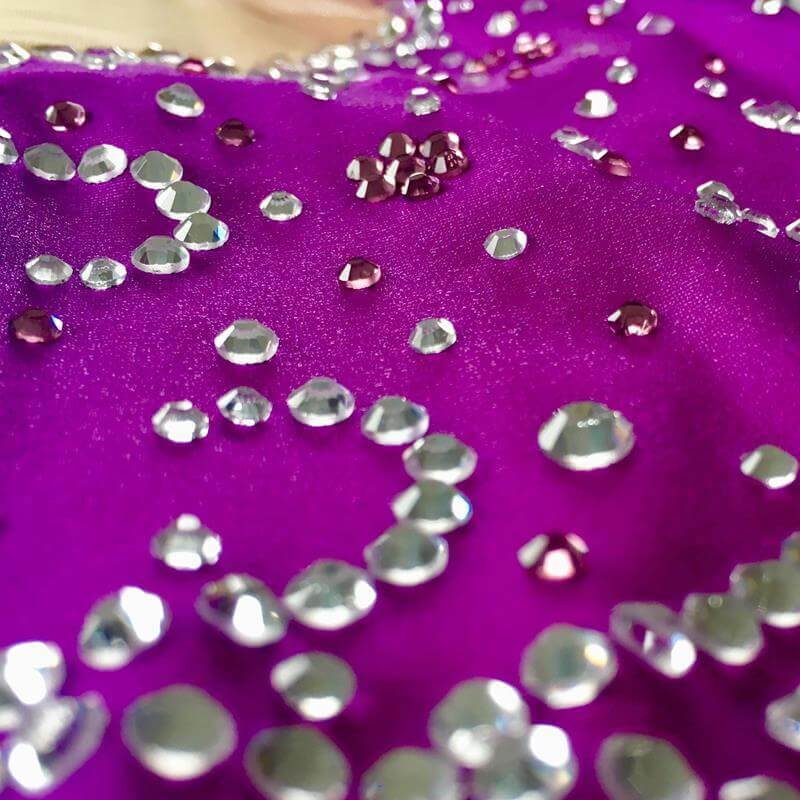 If you’re going to the Olympics or World Championships then yes you’re going to want Swarovski stones on your dress but for everyone else, a lower quality stone is usually more than sufficient. 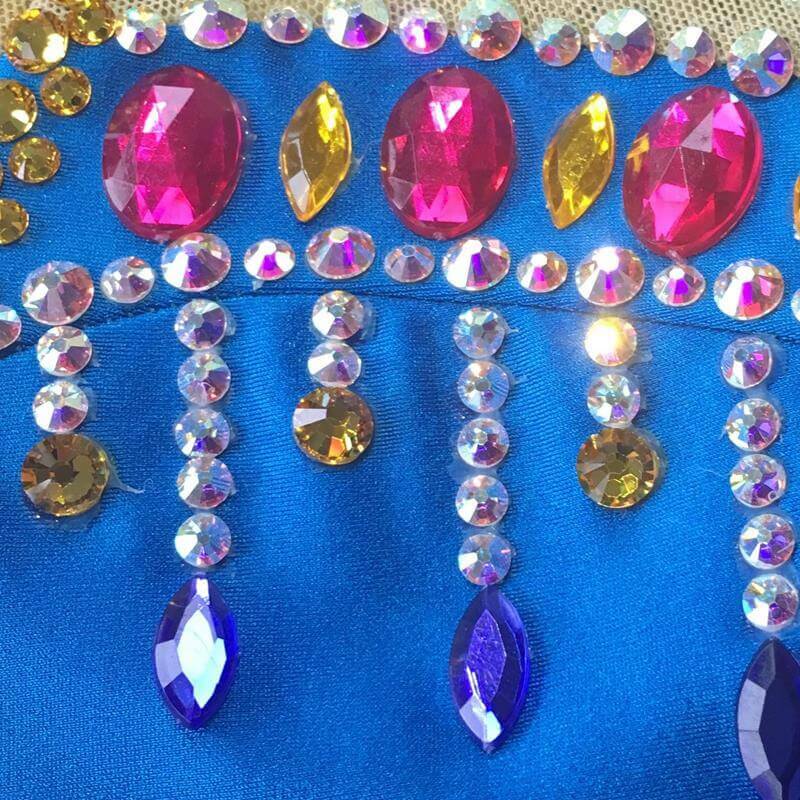 If you’re really set on having Swarovski but don’t have the budget then consider using a mix of Swarovski and other stones to get a heavily stoned but similarly sparkly look. The smaller stones in the pictures below are Swarovski stones mixed with larger acrylic coloured shapes to create a multicoloured, heavily stoned effect. If Swarovski are out of your budget altogether, then the good news is that there are lots of other options out there. The two that I would recommend are Preciosa which are cheaper than Swarovski but still quite pricey or, my personal favourite, Rhinestone HQ, whose stones give a really good sparkle at a significantly cheaper price than either Swarovski or Preciosa. We particularly like their ’Supreme’ cut for sparkle comparable to Preciosa. Another way to get a bit more ‘bang for your buck’ is to mix in some acrylic stones. You can see in the pictures below that both these dresses have used large resin / acrylic stones to enhance the stoned look of the dress. The lighter blue dress uses Swarovski stones for all of the smaller stones, the darker blue dress uses Rhinestone HQ stones. If you do decide to go down this route then be careful what type of glue you use with the acrylic stones as the foil backing is different to that used on rhinestones themselves and acrylic glues such as E6000 can eat into the foil backing and make the stone go cloudy. I hope that this article has helped you decide which stones to use and how to get the most for your money. If you’re interested in trying the Rhinestone HQ stones then all my readers can get a 5% discount off their orders by using the code BIRDS5. Let me know below how you get on with your next stoning adventure or if you have any questions about how to stone your own dress.